The title given to this fifth book of the New Testament in my Bible, and probably yours also, is "The Acts of the Apostles." 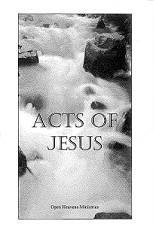 However, in the first verse of the book we discover that it is actually the Acts of Jesus through the apostles. It is in this way that we want to view the Book of Acts and understand what Jesus continued to do and teach through the apostles of the Early Church. It did not cease with the Early Church.